Come one, come all to the Rock and Roll Circus! The two-day multisensory spectacular features world-famous circus acts, famous New York food vendors and a Sixpoint pop-up beer bar. 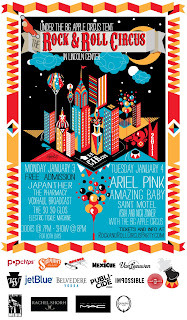 Musical guests include Voxhaul Broadcast, The Pharmacy, the So So Glos and Brooklyn-based punk rock mainstays, Japanther.